Ubuntu 的 Desktop 版本就是 LiveCD ,這 Live CD 可以裝在 USB Key 隨身碟上,但這 Ubuntu Live CD USB flash drive 有個問題,就是 root 沒有辦法大於 > 4G ,這是為什麼呢!! 因為 Ubuntu Desktop 做成 Ubuntu Live CD USB flash drive 時,會將磁區分割成為 vfat ,而 root 檔案會寫成一個 loop file ( casper-rw) ,但 vfat 的檔案上限就是 4G ,如果要讓 root 大於 4g 必須用其他方式來做. 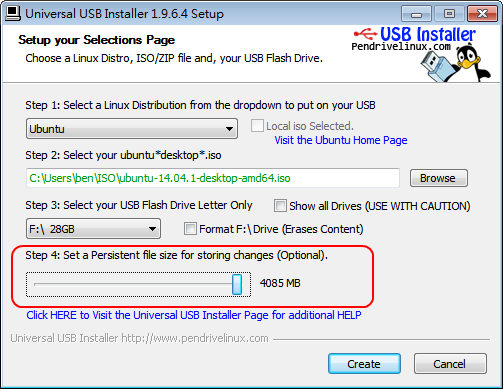 透過 Universal-USB-Installer 將 Live CD 轉換成 Ubuntu Live USB Drive 需要注意的是第四步. 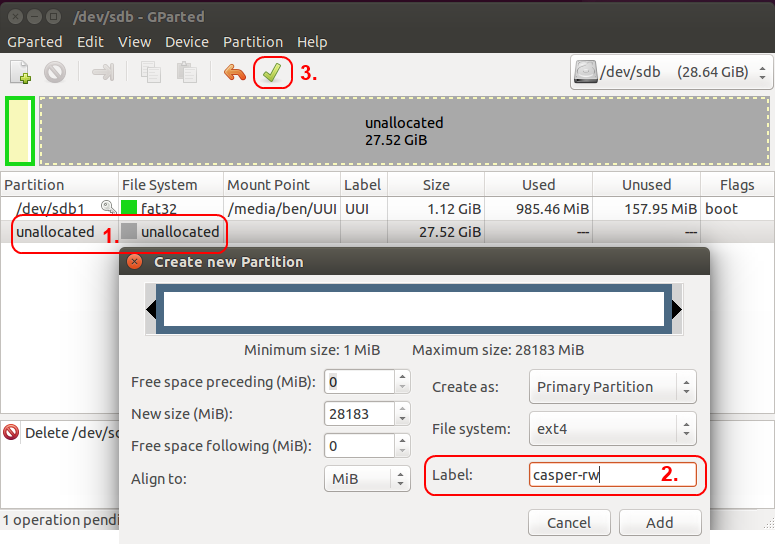 先找一台 Linux 系統或是 windows 都可以,把這 Ubuntu Live CD USB flash drive 內的 casper.rw (root loop file 檔案) 刪除 ,沒有這檔案請重做 Ubuntu Live USB Drive. 這一步主要是透過 parted 的 resize (GParted 圖形介面) 來縮小 Ubuntu Live CD USB flash drive vfat 磁區,但不知道為什麼在 Ubuntu 14.04 (RHEL 7) 下面 resize 沒有辦法使用 (仔細一看說明,resize 將不再支援,建議用戶用 e2fsprogs 套件做放大縮小磁區 ),但在 RedHat (RHEL) 6.5 下使用就沒有問題. parted: malloc.c:2372: sysmalloc: Assertion `(old_top == (((mbinptr) (((char *) &((av)->bins[((1) - 1) * 2])) - __builtin_offsetof (struct malloc_chunk, fd)))) && old_size == 0) || ((unsigned long) (old_size) >= (unsigned long)((((__builtin_offsetof (struct malloc_chunk, fd_nextsize))+((2 *(sizeof(size_t))) - 1)) & ~((2 *(sizeof(size_t))) - 1))) && ((old_top)->size & 0x1) && ((unsigned long) old_end & pagemask) == 0)' failed. RHEL 7 下進入 parted 裡面找不到 resize 的功能. 當 casper.rw (root loop file 檔案) 沒有的時候,系統會找 標籤為 casper-rw 的磁區當成 root,所以這一步需要新增一 ext2 (3)(4) 磁區,標籤為 casper-rw ,可以透過 parted (GParted 圖形介面) 來做. 前面步驟完成後就可以從這一 Ubuntu Live CD USB flash drive 開機吧! 你會發現 root 已經變成 /dev/sda2 , /cow (root) 的大小也變大了.